James Adair was the eldest son of the twelve children of James Adair and Henrietta Connolly. Both of his parents were from Ireland and had married in the neighbouring parish of Dalmellington where his father worked in the coal mines at Craigmark. The couple moved to New Cumnock where his father continued to work as a coal miner and it was here that James was born, in 1862 at Connel Park. The family continued to grow and lived at Blair Street, Craigbank and then later at Lanemark Cottages. Like his father James worked as a miner in the New Cumnock coal-field. In 1885 James, now 23 years old and living at Connel Park, married 18-year-old Janet Brown, daughter of coal miner John Brown and Margaret Blane. They were married at the Bank Free Church. A year later their first child James was born at Auchinleck and siblings followed over the next four years with two daughters Maggie, born at Sorn, and then Henrietta (or Etta) born at Auchinleck. The couple returned to Connel Park, New Cumnock where in 1892 daughter Marion was born and James continued to find work as a coal-miner. Two years later another daughter Isabella was at born Matura Villa at Afton Bridgend near the Toll with James now recognised as a Baptist minister, the pastor of the Baptist community in New Cumnock. Local historian George Sanderson writing in “New Cumnock Long Ago and Faraway” summarises the origins of the Baptist Church in New Cumnock. In 1890 a gospel mission was going around the mining villages conducted by the Ayrshire Christian Union. A number of miners from New Cumnock regularly travelled to Cumnock Baptist Church but they now began to hold meetings in John Ferguson’s house at Lanemark Row, better known as Knowetop. James Adair became the energetic leader and preacher; they began to save towards the building of a church, every penny coming from mining families. Meanwhile they conducted open air meetings in places like Burnfoot and Coalburn; people were baptised in Dalleagles burn, defiant hymns were sung in a room at the top of Blair Street, sermons preached in the Town Hall. By 1893 James Adair was styling himself as Pastor though still a coalminer, and requesting the use of Bank school to hold a Christmas treat for children. The Baptist church is altogether making a stir at present, none more so than the Baptists of New Cumnock. I think they will soon go out of business, a blaze then extinct as so often happens when a common working man – a collier – without any credentials has commenced to do the work of the ministry, as he did last Sabbath in the presence of two or three hundred crowd. He dipped (or he would say baptised) seven persons in the Nith. He has sent as a letter about his congregation but we do not support all that he says so the letter is not published. In 1896 tragedy struck the Adair family in devastating fashion. 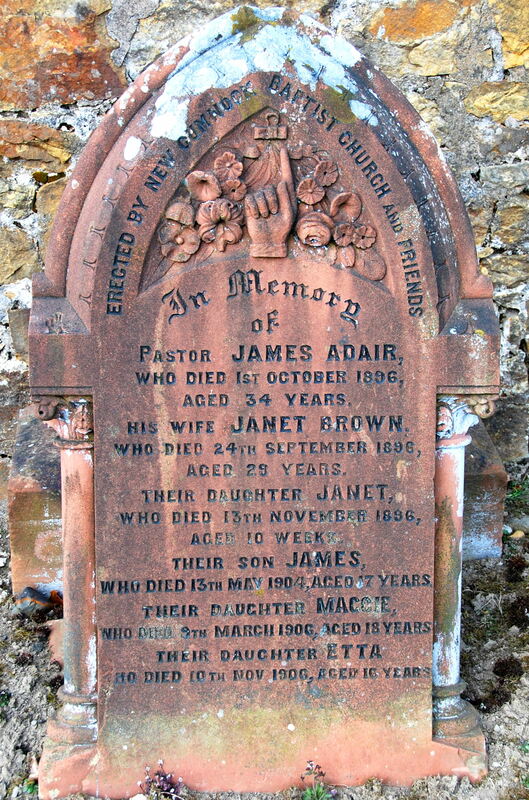 On the 7th September daughter Janet Brown Adair was born at Craigard but sadly her mother died on the 24th September and one week later her father Pastor James Adair died at home at Craigard. Tragically the orphaned baby died 10 weeks after her birth and all three were laid to rest in the Auld Kirkyard, New Cumnock. The remaining five orphans went to live with their grandmother Henrietta Adair who later lived in Rutherglen with several of her unmarried children. In 1900 the first Baptist Church of New Cumnock was finally erected and admirably described by George Sanderson as ‘a fitting tribute and memorial to Pastor James Adair’. Sadly three of the orphaned children – James , Maggie and Henrietta – died in their teenage years and are remembered on the family headstone. Surviving siblings – Marion and Isabella – were taken under the wing of Major Adair, their uncle, who later emigrated to Nova Scotia, Canada.